Well it is the run up to Christmas so we have been getting crafty but have been very lax about blogging about it. Sorry. Here are a few photos of the things that I have been making recently, I will go into more details on some of them in their own posts later. Kicked off with Christmas Puddings… We had to get the jam pan out for these not only to fit them in to cook but also to be able to mix the ingredients in as we didn’t have a bowl big enough to contain all the mixture. There is a lot of Christmas pudding here. 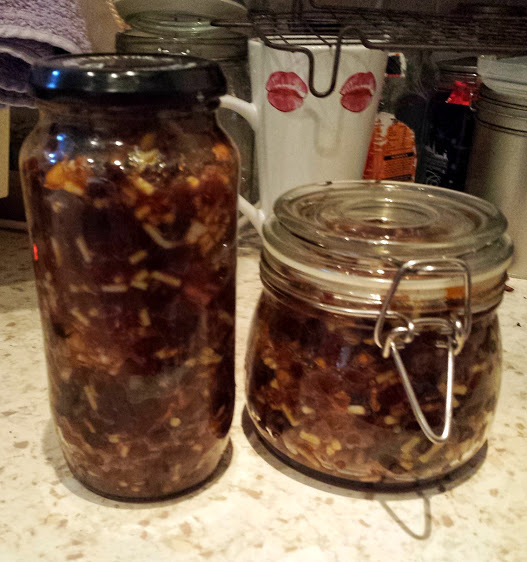 Then eventually I got round to doing a version of a mincemeat recipe which came up on my facebook feed from Good Food. My one contained diced Kumquats instead of orange, its smelt so yummy and citrusy. I caved in and bought a Christmasy fleece blanket, but I decided that it needed a bit more to make it more cozy so I backed it with some Tshirting. Whilst this makes a wonderfully snuggly it was a pain to do as both materials stretch so getting it to lie with out any pulls/wrinkles took a long time. I also decided to teach myself how to do colour work knitting, as I quite like Fair Isle knitting at the moment. I also knitted Nikki an ear warmer like mine but with a simple cable instead of a plait pattern. I have also been making more things but these will be rounded up later and I would probably have made more by that point too.